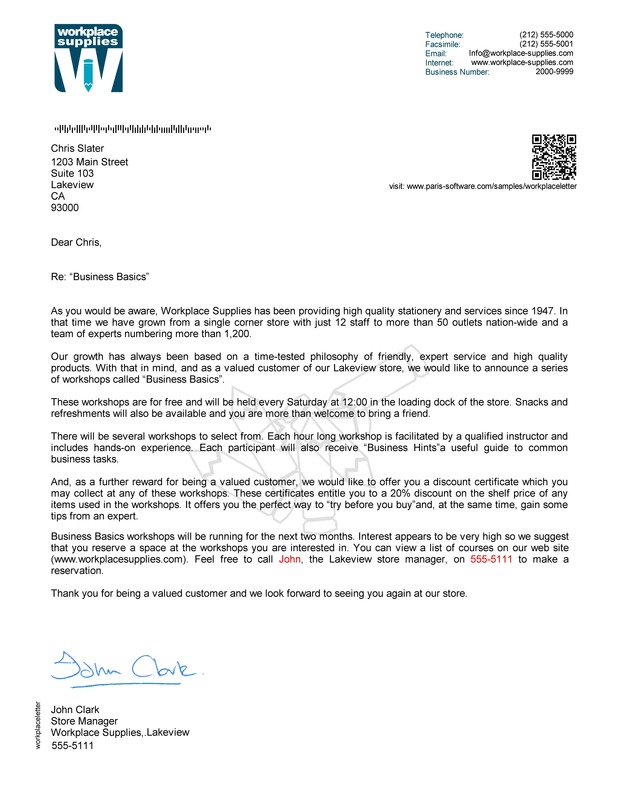 This sample shows how Paris can be used across all industries to print highly personalized letters and correspondence. Now, more than ever, customer expectations are higher in terms of customer service and customer communication. Customers expect timely communication that is specific and relevant to them. On the other hand, this gives companies an extremely valuable opportunity to market and communicate in ways that yields much greater results and customer satisfaction. In this example, we are are printing promotional letters inviting previous customers to attend special events at the company stores. The letter body can be changed according to signals in the data (for example, their nearest store) . The content can be highly personalized to include the customer's name and any other information that may be available. The use of features such as QR codes help extend the reach of the letter and leverage other opportunities such as web content. When producing large quantities of letters for the mail, apply mail sorting to achieve significant mailing discounts.